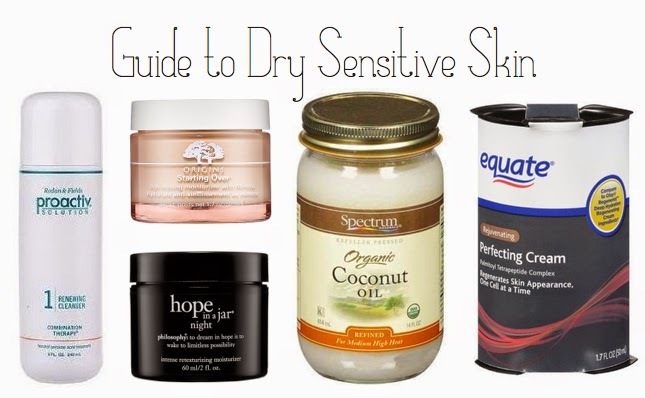 I have very sensitive dry skin. I've struggled with it for years, but finally found a routine that works. For years I wouldn't wear sunscreen, not even the Neutrogena Sensitive Skin. Any sunscreen I tried would make my face burn within minutes of applying. I knew I would be risking sun damage but wasn't willing to suffer the burn. All this changed when I found Origins A Perfect World SPF 25. This is seriously the only thing with SPF that I can wear. Secondly, my skin is dry. Even after rinsing with water, my skin feels tight afterwards. For years I tried all the different acne products to no avail. Having dry skin and using harsh cleansers and toners only strips the skin of oils. Skin that is too dry will overproduce oil causing more acne. A quick tip I learned a while back to tell whether you have dry skin is to notice how it feels after washing it. If it feels very tight, even after rinsing with just water you probably have dry skin. It's a vicious cycle, and after finding this routine I don't stray from it. Origins A Perfect World SPF 25 | Featuring white tea and antioxidants, this moisturizer is free of paragons, sulfates, synthetic fragrances or dyes, and other fillers that I'm sure were culprits of burning my sensitive skin. This pleasant smelling lotion will help prevent signs of aging thanks to its UVA/UVB sunscreens. This miracle moisturizer is a lifesaver if you have sensitive skin like mine. Equate Rejuvenating Perfecting Cream | This lotion is the Walmart brand of Olay Regenerist Deep Hydration Regenerating Cream. I've tried both and I still prefer the Walmart brand. This is like a fresh glass of water for my skin. It is non-greasy and contains Vitamin E, an antioxidant that helps reduce wrinkles. I use this more in the morning before applying makeup, but I also find that it's good to use around my period in place of coconut oil. Proactive Renewing Cleanser | I've tried Proactiv over and over again. For the first few years I did exactly as they said and used all three products as directed. The problem with this is that everyone's skin is different. Mine was too dry to use all the products twice a day, and it didn't help at all with my acne. I completely quit using it for several months, and when I started again I only used the cleanser once at night. In the morning I rinse my face with warm water. I don't use a cleanser in the morning as it strips too many good oils that my dry skin needs. Organic Coconut Oil | This is such a great oil to use for almost anything and can be found in most grocery stores. I love using it as a moisturizer at night. After using my cleanser, my skin is begging for moisture. This oil is clean and light and contains medium-chain-length fatty acids. These make it great as an antibacterial agent as well as moisturizer. Unlike many cream moisturizers, it doesn't contain any water so it won't leave you feeling dry over time. And it's great for deep moisture. I know you may be thinking, "Oil? Won't that make me break out more?" What I've found is that when my face is happy and moisturized, I have less breakouts. I'm not saying it will clear everything up forever, but I have seen some serious reduction in breakouts. I typically don't use this the week before and during my period as my hormones make me produce more oil, therefore I don't need an added source. Hope in Jar Night | I've only recently begun using this product, but I am very happy with it. I use it once or twice a week after cleansing and before applying the coconut oil. This product helps "plump" fine lines and wrinkles with glycol acid. Surprisingly this product doesn't irritate my skin, maybe it's because I only use it a few nights a week. I would definitely recommend this product for any sensitive skin ladies out there. Just start with a little and slowly increase it over a few days. These are my favorite products that I've been using for the past year (exception of Hope in a Jar Night). I've seen a great improvement in my skin and my breakouts. The key is to finding the right routine for your own skin, but hopefully some of these products will help you out! Hey Caitlin! Thanks so much for posting this! I am in dire need of a good face moisturizer with SPF.... If I even look or think about the sun I get burned! I am running out this weekend to find Origins A Perfect World SPF 25. Good luck on week two! I have used the Origins, Hope in a Jar, and coconut oil. All of them are fantastic! I usually use the coconut oil at night if I have dry patches or in the winter because I have more combination skin. Finding an SPF moisturizer that doesn't break me out or cause me to be more oily is an issue. I might have to revisit the Origins though...it's been a couple years since I tried it. I feel like since I am now in my later 20s, I should be doing more for my skin. I don't use anything other than wash with Philosophy Purity. I definitely am going to try some of your suggestions!